Control Composting Odors, Naturally: Municipal sludge is often composted in indoor facilities or composting sheds. These areas create significant odor control challenges. Ecosorb products, either evaporated or atomized in concentrate form with nozzles or humidifying fans, control industrial odors even in very large composting facilities. HITEMA is able to offer a wide range of chiller solutions where one of the main scope is to avoid critical situations during fermentation reaction managing with high competence and experience all the process temperatures during wine production to obtain high quality level of final product. By Hitema International based in Bovolenta Padua, ITALY. By Gasmet Technologies Oy based in Vantaa, FINLAND. By Delta-T Devices Ltd. based in Cambridge, UNITED KINGDOM. We research and develop specific solutions to increase the percentage of healthy food and its shelf life, reducing the impact of fungi, bacteria, mould and yeast, and to enhance process water savings. Pieralisi technology is widely applied in plants that produce energy from Manure (biogas) and alternative energy production from biomass, and, in this industry. Remove securely MDF material and plastic contaminations with REDWAVE wood sorter. 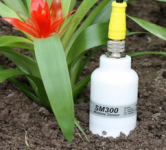 Accuracy and ease of use make SM300 Soil Moisture Sensors well suited to irrigation applications. Readings can be used to optimise irrigation scheduling, or the SM300 can be installed as part of an automatic irrigation system. The sensor`s compact size allows it to be installed in plant pots or grow bags. Cambridge based Delta-T Devices specialises in instruments for environmental science, in particular: agronomy, plant physiology, eco-physiology, data logging, meteorology, soil moisture, solar energy studies and environmental monitoring. We engineer and supply innovative technological solutions to improve fruit and vegetable cultivations and animal breeding. Our commitment is to a healthier, safer condition of all the actors involved in the agri-food chain (farmers, plants, animals, consumers) increasing the quantity and quality of food available, while at the same time reducing pesticide contaminations on products and in the environment. A crusher bucket MB-C50 was used, mounted on a Kobelco, to reduce all inert material brought out from the plant, as the main goal was to access the interior to have a perspective of the future development. By MB Crusher based in Fara Vicentino, ITALY. 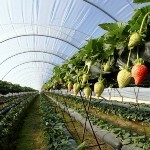 Agriculture harvesting free resources to lower your electricity bill. By XANT NV based in Brussels, BELGIUM. The versatile Opsis DOAS system provides comprehensive emissions monitoring and process control in the fertilizer industry. By Opsis AB based in Furulund, SWEDEN. Agriculture is by far the largest water use at global level. Irrigation of agricultural lands accounted for 70% of the water used worldwide. In several developing countries, irrigation represents up to 95% of all water uses, and plays a major role in food production and food security. Future agricultural development strategies of most of these countries depend on the possibility to maintain, improve and expand irrigated agriculture. Increase your yields while reducing costs at your growing operation. In-Situ’s easy-to-use equipment keeps your hatchery running smoothly, even in harsh conditions. Our solutions simplify aquaculture management, boosting efficiency through faster, more accurate monitoring. By In-Situ, Inc. based in Fort Collins, COLORADO (USA). Pumping / transfert / dosing manure, fertilizer sugar mills, treacle, liquid, sugar and various chemicals. By Albin Pump SAS based in Montelimar, FRANCE. By iCenta Controls Ltd based in Salisbury, UNITED KINGDOM.